Oceanfront Charleston-Style Beach House - a true Sunset Beach island home! This beautiful light-filled oceanfront home has panoramic ocean or inlet views from every room. There are hardwood floors throughout the house and a soothing pale yellow and light blue décor. This 6 bedroom 5.5 bathroom residence is on the eastern end of Sunset Beach in a gated community. The house has a private pool, separate hot tub that flows into the pool, and semi-private boardwalk to the beach. In this signature home, the first floor great room overlooks the Atlantic Ocean and is open to the sleek, fully stocked gourmet kitchen, including a gas range, double oven and oversized side-by-side refrigerator /freezer. The adjacent dining area has Tubbs Inlet views. Furnished and spacious covered porches on both the first and second floor have ocean views. Go up the wide staircase to find a playroom/entertainment area that includes a wet bar and a 65” HD Smart TV and a 60 Arcade console. Sleeps 20 in the following configuration: first floor has an oceanfront suite with access to the porch. It has a king bed, oversize tiled bathroom with a separate bathtub and shower. Second bedroom on this level has a king bed and daybed with a trundle, plus a private bathroom. This room has a step-out balcony to enjoy views of the Inlet. There is a washer/dryer and half bath on this level of the house. Four other bedrooms are located upstairs. A second king suite occupies the oceanfront side, identical to the one below on the main level. Two bedrooms have king beds and daybeds with trundles. One bedroom has a private bathroom, and the other shares a Jack & Jill bathroom with the kids’ four-person bunk bed room. The king bedded rooms with trundles have front balcony access and views of the Inlet. Bed and bath linens are provided, with beds made in preparation for your arrival. Other amenities include a three-story elevator, gas fireplace, outside shower and Wi-Fi throughout the house. Every bedroom has a smart TV. The pool can be heated October – May for an additional $100 er night. Hot tub is $100 per week. Cannot heat both at same time. Perhaps one of the most picturesque and grand houses in the region with amenities surpassing all expectations. The craftsmanship of this house was staggering coupled with a beautifully designed interior - making for a wonderful stay if one never stepped out the door! Yet, when one steps out to the multiple grand porches, the ocean and sound view is simply magnificent. One essentially has a private beach with a view of the end of Sunset beach island to enjoy. The heated pool and hot tub were wonderful amenities that capped off a most memorable experience! 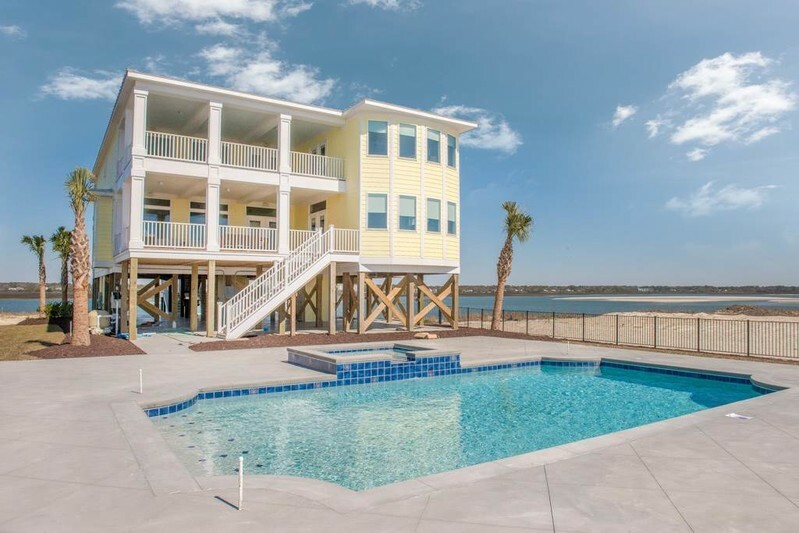 This brand new beach house is simply gorgeous! Everyone will appreciate the large beautifully decorated rooms with their own spacious bathrooms. The wide hardwood floors immediately beg you to remove your shoes and feel at home. High ceilings, wide hallways, windows everywhere, multiple relaxation spaces, inviting evening lighted pool with hot tub, and private walkway to wide beach all feel like luxuries. Frankly, the only aspect better than the home itself are the best three directional water views in North Carolina - visible from everywhere in the home! We had a wonderful story at this home. There were 12 of us ranging from teens to 70s. We had plenty of space and room to spread out. The home was beautifully decorated and comfortable too! The large decks facing the ocean were one of our favorite parts and we used them a lot. The private pool was wonderful and a great bonus. As for the beach area, due to our location it was almost like having a private beach which we loved. Highly recommend this beautiful property!